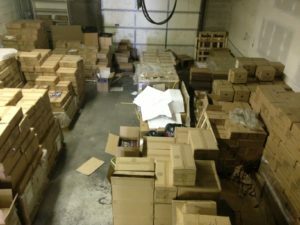 Today I walked the warehouse planning the work for our “warehouse day” next week when I haul my four kids over and pay them to help me reorganize. There are boxes of books to re-stack, garbage to haul to the dump, recycling to haul out, and various other related chores. All of this is preparatory to receiving the Planet Mercenary books in a few weeks. I have to physically make space on the floor for an as yet unknown number of pallets. I’ve paced it off and I’m confident I can make space for up to 10 pallets, which should be sufficient. I always have pre-delivery anxiety about not having enough space. Another task which needs doing is pre-bundling components that will go into packages. Many of the packages have the same contents. It is much easier to grab a single bag that contains 4 pins, 1 coin, 1 dice set, and a deck of cards than it is to grab each of those things individually for each package. However it does mean that we have to sit down and make up the bags containing all the things. That work needs to happen before we can begin shipping in earnest, and I hope to get it done before the books arrive. A related pair of tasks: The GC screens arrived flat and they need to be folded in order to fit into the shipping boxes. The Deluxe Handbrain screens will arrive as individual units and will need to be assembled into 3 screen sets with matching pins. Invoices need to be printed and sorted as well. That process will begin first for the Handbrain Screen Kickstarter, because that is where I have the information about who might want to combine their orders. I have to collate that information before I can ship any of the orders. However I can’t get rolling on that quite yet. People need more time to fill out their surveys. I don’t know yet whether the Handbrain Screens or the books will arrive first. Ideally I’ll have a couple of weeks between the arrivals. Most likely they’ll arrive within a week of each other because those were the timelines I was given. Once both shipments arrive, all that remains is for me to ship things out. I did preparatory accounting yesterday. I’ve got lots of shipping bills incoming, so the accounts need to be as prepared as the physical spaces. I’m tempted to run a sale to clear out some inventory and create more wiggle room in both the accounts and the warehouse. Yet running a big sale and triggering more shipping right in the middle of preparing for a massive shipping seems a bit crazy. The truth is that I have enough space in both places to get the job done, even if it will be a little tight for a while. Sounds so simple doesn’t it? Good luck with it and some of us do realise just how hard it is to do something which sounds so simple! There will be over 3000 packages to mail with a variety of different contents, but compared to the complexity of putting an RPG book together, this feels familiar and simple.